Soy sauce, cilantro, and potatoes. I use soy sauce in a lot of marinades and sauces, but I never, ever would have thought to use it with potatoes. And cilantro is my favorite herb, so that sold me. 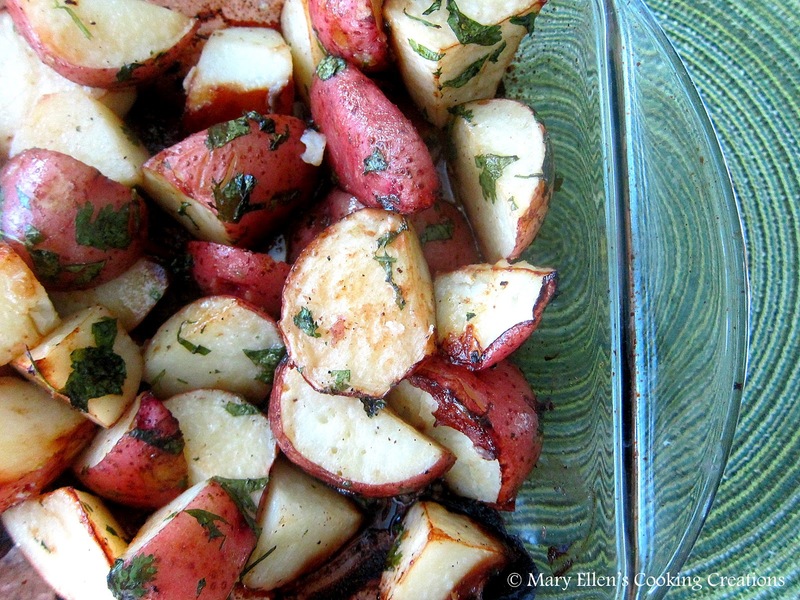 The recipe I chose was for Soy-Cilantro Roasted Potatoes, a recipe created by Nichole (Nichole - I'd love to know what made you try soy sauce with potatoes - so interesting!!) You toss the potatoes with the soy sauce and cilantro, and roast them for about 45 minutes. The soy sauce caramelized, and the potatoes got nice and crispy. These flavors worked so well on the potatoes, and I will definitely make this one again! 2. Rinse off the potatoes and cut into small wedges. 3. Transfer the potatoes into a large bowl. Add the soy sauce, cilantro, salt and pepper (and garlic powder). Toss well to coat. 4. Spray a baking dish with cooking spray. Put the potatoes into the baking dish. 5. Bake for approximately 45 minutes or until the potatoes are soft. Glad you liked it! It was a bit of an accident to create, actually. I had the marinade for the meat in one bowl and the potatoes in the other. I got distracted and put the soy in the wrong bowl then figured I might as well just go with it. I have put new potatoes on skewers in a soy sauce marinade, they are amazing. I cannot wait to make this side dish! I never would have thought to put soy sauce on potatoes either! I might have to try this. Mmm...what a simple side dish. I've been trying to expand my side dish repertoire, I'm glad you made them and now they have my attention. I have now made these twice, I love them. Great recipe! !